It’s definitely BBQ season! 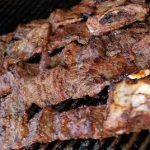 My previous two posts were Korean BBQ dishes, but no series of Korean BBQ recipes is complete without one for galbi, grilled marinated beef short ribs. The word galbi literally means “ribs,”and the full name of this dish is galbi gui (grilled). It is the most popular backyard/outdoor BBQ dish in Korean homes. 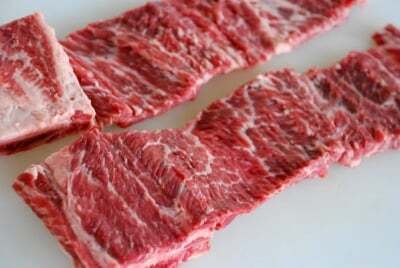 Galbi short ribs come in two different cuts – flanken cut (ribs are cut thin across the bones) and English cut (ribs are separated and cut into short lengths). 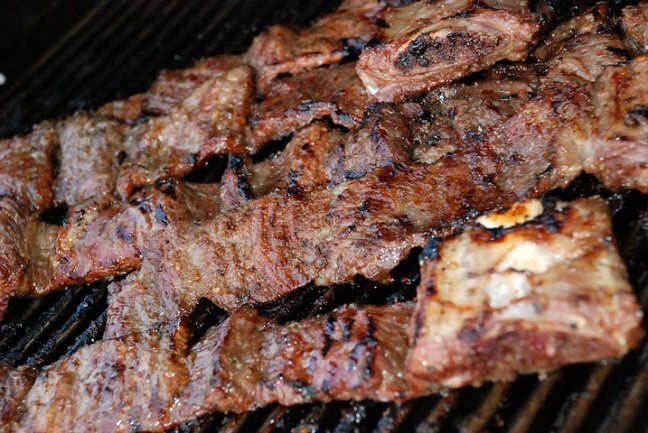 Koreans call the flanken cut “LA galbi,” named after the city where early Korean immigrants started to use this cut for galbi. 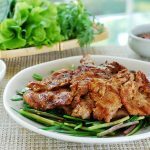 While LA galbi is convenient and increasingly popular in America, the butterflied English cut is classic for grilled galbi in Korea. Regardless of which cut is used, short ribs are a tough cut of meat and need to be tenderized for grilling. 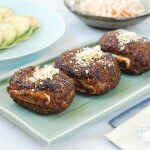 Traditionally, grated Korean pear is used as a tenderizer, and it also adds a subtle fruity sweetness to the marinade. Korean (or Asian) pears are sweet and juicy, and these days they are widely available here in America. Properly prepared galbi tastes good without grated pear, but to me pear takes galbi to a different level. Some people use kiwi, but I would advise against it because it tends to break down the meat too much. 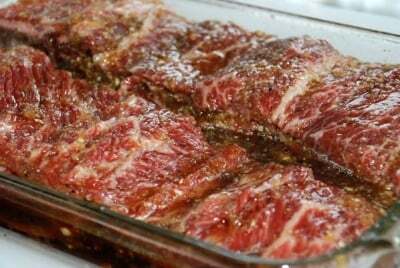 Grated onion and alcohol in the marinade also tenderize the meat. Over the years, I’ve made this dish countless times for my family and various guests. This relatively forgiving recipe can be easily doubled, tripled, or quadrupled, making it perfect for large groups of people. These grilled ribs are so tasty that everyone loves it every time. The smooth balance of sweet and savory flavors is certainly palate pleasing! Your butcher may be willing to butterfly the short ribs for you. To do it yourself, you will need a sharp knife. Holding the bone part firmly, slice the meat lengthwise close to the bone almost to the other end (1/4 to 1/2 inch from the edge). Do NOT cut through. Open it up like a book. Starting from the middle, run the knife through the meaty part, 1/4 to 1/2-inch from the bottom, almost to the other end. Open it up. Repeat if necessary to open the meat into a long thin strip. This might take some practice, but it’s totally worth it. 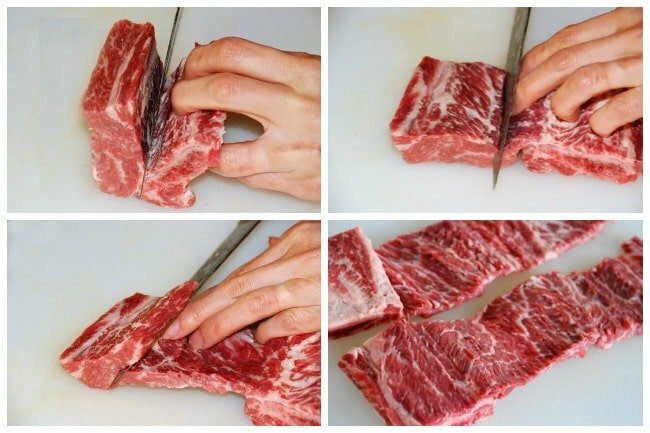 If this does not work, simply slice the rib meat into 1/4 to 1/2-inch thick rectangles. I love bulgogi from our local Korean restaurant. I’ll have to try this. Thanks. Try it and let me know how it turned out for you. Thanks for stopping by! Thanks for sharing your recipe – though I’ve always found bbq ribs a little daunting to make at home, it’s nice to know there’s a great recipe waiting for me should I want to attempt this! I want to try this the next time we grill. I never knew there was Asian Pear involved. Denise – I believe good Korean restaurants do use pears, but you’re right it’s subtle, unlike citrus fruits. Pear does make a big difference in galbi. I wish I can say it’s my secret ingredient (lol), but it is classic for galbi in Korea. I really hope you get to try this recipe. Thanks always for stopping by! Melissa – Please try it! The marinade is very easy to make. Pear is commonly used by Koreans. Use it if you can easily find one, but it will taste still good without it. Marinate it overnight for best results. I’d love to hear how it turned out for you. Thanks for visiting and hope to see you here again soon! This looks so good. I would love to try this out. Cinda – Hope you try it! It’s easy to make. My family and friends love my short ribs. 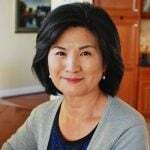 Thanks for checking my recipe out! I have been secretly waiting for this post! 🙂 My family looooves galbi! Yours looks so delicious. Thank you so much for sharing! Judy and Lauren – Hope you try the recipe and let me know how it turns out for you. Thank you! Hyosun, Goodness..this is my absolute favorite. When it comes to BBQ, the taste is just right and delicious for me!! ha ha ha…even if i can prepare and cook this myself, I still sometimes buy the ready mix one they have in the groceries. Thanks for sharing the recipe..korean food is trully magical!! That was great ! A tip on slicing if you put the ribs in the freezer for an hour or 2 before slicing it makes it easier to slice. I was browsing your site and encounter this post. 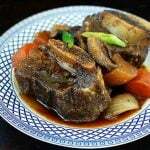 This is a nice tutorial for short ribs! 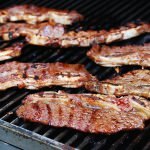 We love Korean short ribs… I already bookmarked it and can’t wait to try it soon. I wish I found this recipe sooner! Thanks for the awesome recipe!! Thank you, Nami! 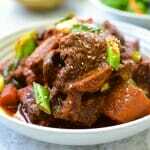 Hope you try the recipe and let me know how you liked it. 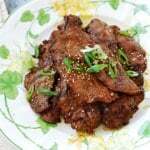 I’ve tried making different types of kalbi for my blog too (prettyntasty.com) but never tried it with honey. I will definitely try it. I plan on trying this recipe this week! Thank you for sharing! But I wonder… can I substitute apple for pear? You can simply omit pear if you don’t have one. Apple won’t hurt either. Thanks for using my recipe! Enjoy! It’s rice wine, not vinegar. Either one (seasoned or unseasoned) is fine. Seasoned one (mirin)is usually a little sweet, so just taste the marinade and adjust sweetness to your taste. Hope this helps. Let me know if you have any other questions. Enjoy! Hi, when we go for korean bbq, there’s often a sauce (like soya sauce but much lighter and a little sweet) for dipping the barbecued meat, what exactly is that sauce made of? Hi Teresa – Sorry about the late response. I’m sure every restaurant has its own recipe, but it basically is a mixture of soy sauce, rice wine, sugar and some sort of flavorful broth which is made with aromatic vegetables and sometimes fruits such as apples. Anchovy or dashima (dried kelp) broth can be used as well. Hope this helps. Did I understand the recipe correctly, you only grill for approximately 8-10 minutes? Yes, but adjust the time depending on your heat level and/or desired doneness. I am going to make about 18 pounds of ribs so I plan to multiply everything by 5x. Do you think I really need 5 cups of water? It seems like a lot! That’s a lot of ribs! 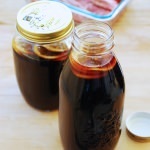 I suggest you keep the soy sauce to water ratio, but you may not need 5x marinade. Try 4x (similar to economies of scale concept? ).